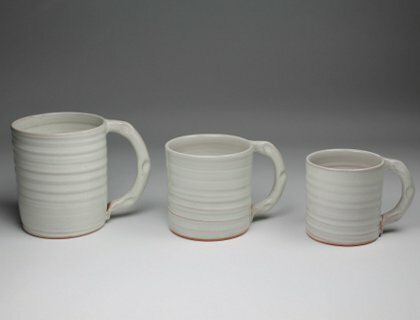 The Jumbo Mug (leftmost in the picture) is the largest mug and will hold 12 ounces of your favorite hot beverage. The Rowantrees Fishtail handle allows a four-finger grip that is firm, safe and comfortable. Your knuckles will stay well clear of the hot mug.